HEIRLOOM. While today's impatiens, a shade-loving hybrid of African species, was virtually unknown in gardens until after World War II, balsam, which is native to Southeast Asia, was a well-known favorite by 1900. Balsam grows well in both sun and shade, and we recommend areas with some protection from afternoon sun. It sprouts in only 4-5 days and flowers early, growing to be 12-24" tall. The narrow plants hold their blooms close to the central stem. Victorian gardeners removed some leaves to better display the 2" across, perfection pink, camellia-like blossoms. Direct sow seeds in average soil in full sun to part shade after all danger of frost. Sow seeds thinly and evenly and cover with ¼ inches of fine soil. Thin to about 18 inches apart when seedlings are 2 inches tall. Balsam loves heat, and plenty of water. 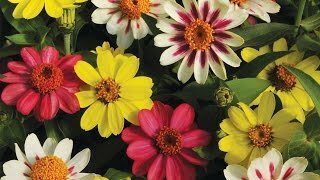 Beautiful in mixed borders or shaded beds. Makes a nice temporary ground cover. Plant in drifts and let fill in, or use them as edging plants along walkways, terraces, or at the front of a bed or border. Some gardeners remove some leaves so it is easier to see the flowers. Balsam, Mix is rated 4.8 out of 5 by 17. Rated 5 out of 5 by Green Mike from Grew like a wild fire!! Planted these in March last spring and they began to grow, and grow, and grow. I was worried they would get too big inside and couldn't wait to plant them outdoors. I was not disappointed. These flowers took off and grew to about 28" and flowered all year til about October. They were beautiful and everyone wanted to know what they were. They had never seen flowers like these where the blooms come on the stalks of the plants. Rated 4 out of 5 by LuvFlwrsGirl from Much larger than description I had a huge mass of flowers so thick I could barely get in to cut some, haha. They grew about 4' tall and 2' wide. Grown in rather sandy soil, part shade, not fed a lot. They are pretty flowers, a bit unusual, drop their spent flowers on the table, last long in a vase, BUT the main stems were twice the size of my thumb and super tall so hard to fit in a vase. I will grow them again, further apart, and I would recommend them with cautions to do just that. Rated 5 out of 5 by Nana Carolyn from Wonderful flowers, attract butterflies and bees I had some of this volunteer in my yard, started with 3 plants, now have more than 400, but they are so pretty! I love them. Rated 5 out of 5 by BeeLover from Beautiful flowers, excellent vase life I am glad I bought these flowers. They are very pretty and they last a while in a vase. When you first pick them they may droop over, but they will straighten out over night. The height on mine are higher than described - mine is waist high (About 3'). The spread is about 2'. They were direct sown in a area where cow manure was added and they get afternoon shade. The stems are very thick (Bigger than my thumb). I have not notice any scent, but the bees love them. Rated 5 out of 5 by kathkeane from Outstanding value, beautiful and majestic I bought these because I remember as a child that after they flower you can squeeze the pods and the seeds shoot out. I had no idea that when they flowered this year in my garden they would be so pretty! They are about 18 inches tall and I have them next to some nasturtium that also looks great. I am going to order more seeds and keep these always in my garden. This was a great value and I love them. Rated 5 out of 5 by chrism from Vigorous growth and beautiful colors I put these seed in late (early August) to add some new life to my perennial bed and as a trial for next year. These plants came up quickly from seed. The colors of the flowers are bright and cheerful. Rated 5 out of 5 by SummerLove from Easy to grow Even for an amateur gardener like me, I found the seeds all germinated then I planted them in a shady spot. They bloomed all summer and had a lovely fragrance that would make me stop and enjoy while doing my daily chores outside. After using impatiens for years I am now hooked on Balsam and will buy it again next year. Rated 5 out of 5 by Flowerette from Balsam Mix Surprise I expected the Balsam Mix flowers to be delicate. The flowers were delicate and multicolored but the stems were huge. I planted them in my hanging container but they rapidly outgrew that. Next year I'll plant them in the main garden. They are quite beautiful with pink and purple flowers blooming for a couple of months.